People do search for various ways on how to make money online. There are number of options which can be useful to make money online. 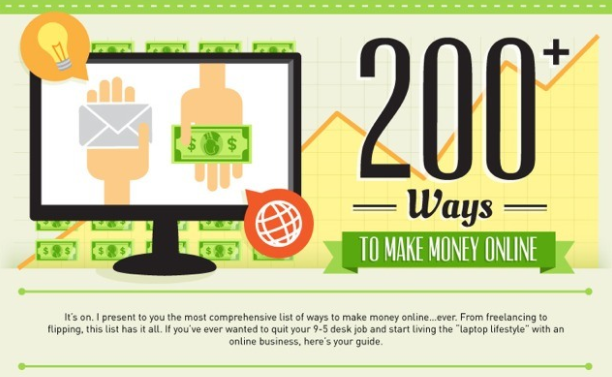 As the name might imply, there are a lot of items on this list of ways to make money from the internet (over 200 to be more specific), so be prepared for a lot of scrolling because this is one seriously long infographic. If you’re ready to make money from the internet, you’ll first need to decide on the general method you intend to use, whether that be selling your old stuff, freelancing or site flipping. Then you’ll need to find the right sites to give you the tools you need to make money from the internet, such as eBay, Elance or Sedo. Fortunately, this infographic features information on both the general logistics and the tools so you can develop a plan to make money from the internet in no time.